"I see death!" cries Long John Silver in Raúl Ruiz's Night Across the Street. Ruiz, too, beheld surcease, his own from liver cancer, while making Night, which he turned into swan song and summa, fond farewell and career précis. Terminal works such as Mozart's Requiem and Pasolini's Salò can be misinterpreted as prophetic auto-elegies, but Ruiz's chronicle of a death foretold joins such films as John Huston's The Dead and Derek Jarman's Blue as a work of intentional valediction. 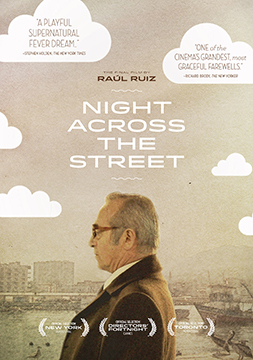 The film's original Spanish title, La Noche de Enfrente, places night opposite or across the way, but, metaphorically, also in front of us and unavoidable: The end of day is imminent, as it was for Ruiz. The encroaching noche eventually engulfs all. "Death comes and it stays," as Jean Giono says in the film. Faced with mortality, the Chilean-born maestro produced a memorializing miracle: a retrospective jest full of tenderness, free-wheeling wit, and regret. Long John Silver clarifies what kind of demise he espies in the cards: "The death of a loved one." Few directors were as beloved as Ruiz, and life seems untenable without more of his films to anticipate. At least we have this final infinite night to fathom. As the opening aerial shots of the sere coastline of Chile signify, the last film of Ruiz's prolific career marked a homecoming for the director. It is heartening to see the logo for the "Gobierno de Chile" in the credits, given Ruiz's long exile from his country after the Pinochet coup d'etat in 1973. (The political debate between soccer players in the film, shot in long take, refers obliquely to the right-wing dictator's rule.) Itinerant trickster or, to use Giono's term, "immobile voyager," Ruiz located in France but made films in many countries and languages, from such outlandish early masterworks of kitsch exoticism as City of Pirates, Three Crowns of the Sailor, and Top of the Whale, in which Hammer horror conjoins with Dostoevsky and Doris Day, characters speak a lingo concocted by the director, and actors are suddenly switched or replaced without comment, to the Viscontian swank and classical grandeur of such late literary adaptations as Time Regained and Mysteries of Lisbon. Night Across the Street also marks another return for Ruiz, to the proliferating "tall tale" narratives and artisanal artifice of his early work, whose baroque visuals were reliant on garish filters, cut-rate special effects, unanchored space, impossible point-of-view shots (one from inside a mouth), and cheesy surrealism (worm-eaten cadavers enjoying a sea vista, splattered brains fashioned into an "island of pirates"). In Night, Ruiz once again employs his arsenal, now enhanced by CGI, of such visual contrivances as Welles-like deep focus, greatly exaggerated, with objects portentously looming in the foreground (e.g., the ranks of bottled ships in Don Celso's room), and the "glide shot," in which camera and character skim the floor together at equal speed or a stationary actor is propelled forward by unseen means, confounding all conventional sense of cinematic stasis and movement. (Ruiz treats the young Celso, complaining about his poor marks in math, to a modified version of this shot.) The director's taste for the Borgesian and baroque-the film's color scheme is perversely keyed to shades of cerise-also emerges in his concern with extravagant language. Where but in Ruiz would someone move to a city simply because of its elaborate name? "Antofagasta," Giono exclaims, "that word is a treasure!" Night is full of Ruiz's trademark trompe l'oeil trickery-bronze filters, "lying" mirrors, dubious dioramas, and devious backdrops that feature people walking or riding their bikes backwards along the port, or the obviously painted flat that Celso and Ugalde stroll along, a yesteryear panorama of horse-drawn carriages that suddenly gives way to an actual street scene with contemporary cars. Nurtured anachronism is another of Ruiz's signatures, and Night merrily mixes temporal cues, its instruments, clothing, buildings, and vehicles signaling a past-the "theatre of shadows" that Jean Giono speaks of-that always seems co-extant with the present, such as in the jokey shot at the 75-minute mark that places an antique building alongside a modernist one. (Jorge Arragiada's sly, insinuating music score similarly draws on both Maderna and Mozart.) Night is fairly obsessed with time and transience: Days, dates, and hours are frequently mentioned-Monday is a good day to murder Don Celso!-and the clunky alarm clock that Celso carries to remind him to take his life-sustaining pills finally proliferates into a cacophony that portends his end. Time "stumbles" in Night and "doesn't pass. The hours don't follow one another." Time seems both static and elastic, space ever pliable, in Ruiz's crumbling funhouse, and events rarely ensue with any logic, causality, or certitude. (Celso's coworker complains, "You've been utterly incoherent lately!" and some might feel the same about Ruiz.) "Did that happen, or did it seem to happen?" Long John Silver asks Celso near the end of the film, emphasizing the unreliability of the foregoing. In Ruiz, indeterminacy reigns. "What hands?" Celso demands when Giono claims he is moving them. Characters variously maintain that "rhododendron" (Ruiz's Rosebud!) is a shrub, a fish, or "if anything, a horse." Young Celso fulsomely describes family members then quickly insists they were long dead or non-existent. Beethoven appears at a soccer game after someone mentions his Fifth Symphony, but the accompanying music is the allegretto from his Seventh, and when he visits a cinema, the film appears to be a montage of three different films. Characters forever correct, amend, or contradict each other-e.g., Celso's insistence on Thomas the Apostle and not Thomas Aquinas-but few proffer a straight answer to simple inquiry. When Celso asks the waiter when lunch will end, the latter names four possible hours, and when challenged as to who discovered Chile, Celso vacillates between two responses. If fleeting time can take on the solid form of marbles, as Giono insists, facts become malleable in Ruiz's unfixed world. As Celso tells his inquisitor, "It depends." Appropriately for a career summation, Night is replete with references to Ruiz's life and career. Long John Silver hails from Ruiz's adaptation of Treasure Island; Jean Giono harkens back to Ruiz's version of the writer's Les Âmes Fortes; while the Adamov mentioned by Giono whose name "rings a bell" refers to Ruiz's rendering of Le Professeur Taranne. One might also argue that in the film's abrupt shuttle between past and present, Celso's childhood and senescence, and its emphasis on sense memory, Ruiz also indirectly invokes the Proust of Time Regained. Such seemingly insignificant details as the poster for El Peneca that hangs in Don Celso's room turns out to have personal meaning; a children's weekly published in Chile from 1908 to 1960, it no doubt conjures fond memories from Ruiz's infancy. (Antenor refers to seeing John Silver in El Peneca during the séance.) Too, the film's maritime setting and countless references, visual and verbal, to the sea and ships conjure Ruiz's own genealogy, as a descendent of seafaring storytellers. Ruiz's journey into the night dotes on mortality-count the number of times "death" and its variants are uttered-and marks his finale with a catalogue of casualties: the Protestant firefighter whose funeral cortege occasions an unusual overhead shot; the uncle who hangs himself and the niece who drowned while on vacation; the children who perished in the snow. Everywhere are signs of imminent demise: the cards that predict the death of Señora Nigilda the landlady, and the anonymous exhortations to assassinate Celso that appear on a restaurant wall and in a wash basin. The boss' retirement sonnet ends with the phrase "and dark deaths," while a song later invokes farewell: "Why my heart regrets this sweet adieu." At the film's outset Giono instructs his students to shut their eyes so they aren't distracted, but by its end "close your eyes" becomes an invitation to the big sleep. "You can't kill yourself," Celso counsels, "You lend yourself to death." Decease proved less provisional for Ruiz, and as Night Across the Street so movingly proves, the world is immeasurably diminished by his absence.